Services - IMPROV RECORDS, INC. 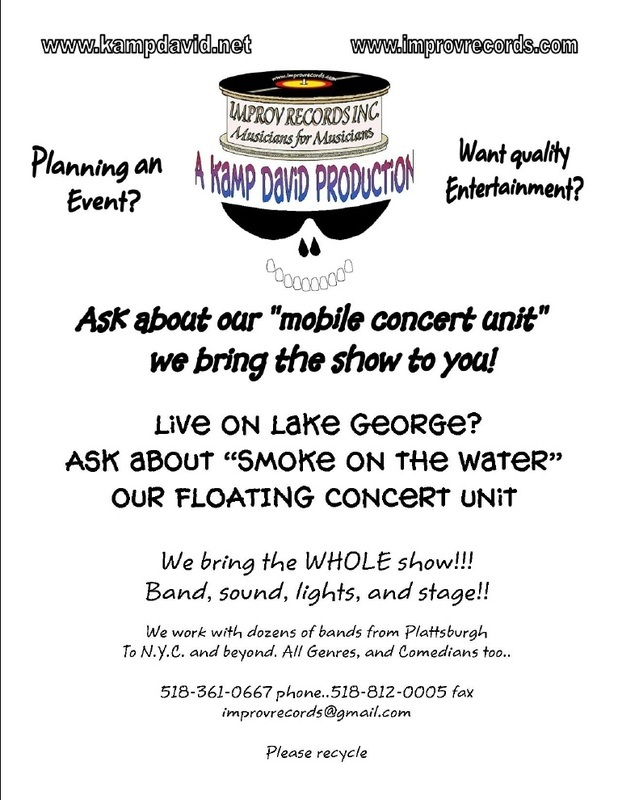 Advertise to the vacationing Lake George crowd for our Friday's at the Lake Concert Series! We also have advertising on one of our many arts and event related web properties. Hire our in-house artist to work on the look of your music project or event! He set up a demo site for your music here, is capable with Wordpress,Ddrupal,Moodle, and other Content Management Systems and scripts. Improv Records provides live sound solutions for your shows and events, studio sessions for up and coming talent in the upstate New York region, live recordings and releases, and event promotions. We also have a new in-house artist that will translate your music into art and graphics. Improv Records works closely with the beautiful and unique Lake George community and is proud to be a part of it. Please use the contact form to start working with us today! Print or download our flier. Print or download our logo.